By special request, I was asked for the recipe of Bubur Biji Delima, a porridge made with pomegranate seeds and coconut milk. At least that is what we are made to believe. Here is the kicker, in Indonesia pomegranate seeds porridge is a dish that is actually not made of real pomegranate seeds, they are special grains made from yam flour (bengkoang aka as Jicama, Mexican turnip) and coloring. These grains can be bought ready made in the store. Because it is made from yam flour, it can be said that these ‘pomegranate seeds’ are a good source of carbohydrates. As I cannot buy these grains here in the US and since I am on a low carb diet, I decided to make another ‘inspired’ version with real pomegranate seeds. This recipe is for one person. Put water in a pan ad sugar, pandan leaves and salt and bring to a boil. Enter the pomegranate seeds into the boiling sugar water. Take from heat source when water boils again, drain and set aside. Coconut milk: bring the coconut milk with the sugar and pandan leave to a boil. Stir constantly and slowly. Add the cornstarch solution, stir and cook until the milk thickens. Lift from the heat source. 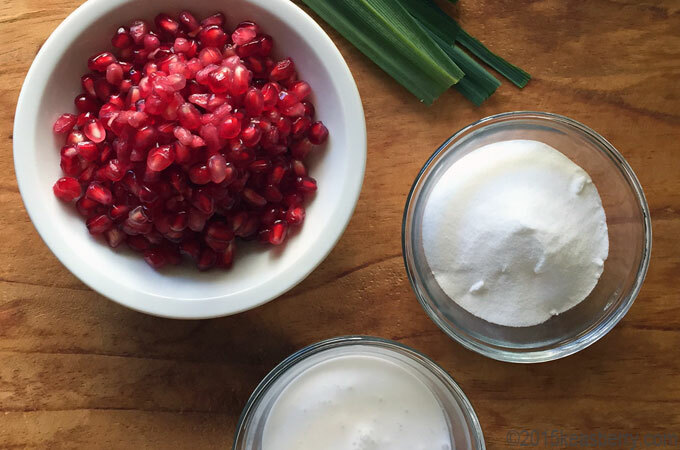 Put the pomegranate in a bowl and add the coconut sauce. Serve! Put in a bowl and stir in red coloring paste, the strawberry paste or syrup until evenly mixed. Add the colored yam pieces in the starch and then turn all the pieces until everything is evenly wrapped in the starch. Cook the coconut milk, salt, sugar and pandan leaves, stir and add the starch, stir until thick. Serve thickened coconut mix over the yam.